President Barack Obama engaged in an illegal war against the nation of Libya in 2011. At that time, I wrote about why this war was a violation of the War Powers Act. Many people, including members of his own political party, called for the President to be impeached because of this violation of the law. This illegal military action has now led to an act of war against the United States by radical Muslim's and the murder of US Ambassador J. Christopher Stevens, and three other Americans serving as security guards for the Ambassador. This war against Libya and the subsequent retaliation was completely unnecessary. 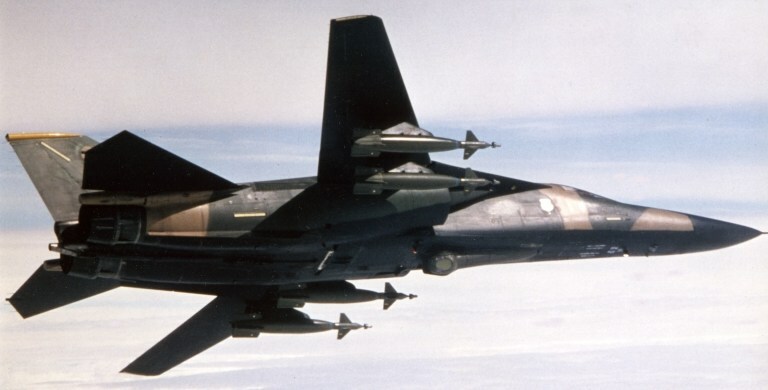 In 1986, a flight of eighteen F-111F's from RAF Lakenheath's 48th Tactical Fighter Wing, under the direction of President Ronald Reagan, responded to the murder of American citizens on Pan Am Flight 103 by dropping sixty tons of bombs on Libya. On a personal note, not long before this raid, I was a member of the 48th TFW and worked on the team that installed the weapons delivery system, PAVE TACK, a smart bomb system used in the Libya raid. This action delivered a very solid diplomatic message to Colonel Muammar Gaddafi and he was seldom heard from again. In recent years, Libya has even taken actions to move closer to becoming an ally in the region - until Obama took the action of illegally supporting a civil war in Libya which eventually removed and murdered Gaddafi. 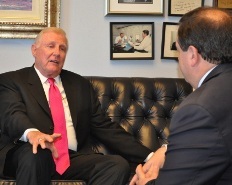 On Tuesday of this week, almost at the same time the US Embassy in Libya was under attack, I was speaking with US Representative Dan Burton (R-IN) in his office located in the Sam Rayburn Building in Washington, D.C. on this very issue. 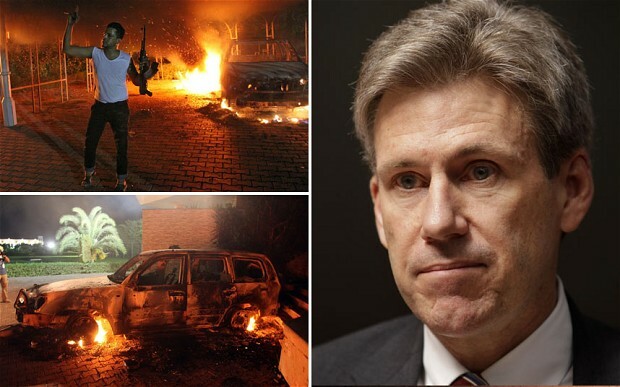 We did not yet know about the attack and the murder of Ambassador Stevens. We discussed President Obama's foreign policy as it related to the overthrow of Egypt and Libya and the subsequent disaster these countries have become under the control of radical Muslims groups like the Muslim Brotherhood. Burton has served in the U.S. House of Representatives for 30 years - much of which on the House Foreign Relations Committee. He has consulted on foreign policy with every U.S. President since Ronald Reagan. Rep. Burton said, "It's a tinder box over there. This Administration has really hurt the United States and our future foreign policy. It's a disaster." Very prophetically he projected, "It is very likely we are going to see a major conflict over there because of this Administration." Little did we know, attacks against Americans in both Egypt and Libya were already underway. I asked Mr. Burton if he thought the Administration's foreign policy blunders were a result of incompetence or was it a designed policy to weaken American influence in the world. Burton strongly replied, "The President has no experience - two years as a state senator, two years as a United States Senator - now President of the most powerful country on Earth." In a very candid statement, Burton said, "It is probably a combination of both. Incompetence and he has a very liberal attitude. I think he deliberately wants to diffuse the popularity and strength of the United States. I think it is by design and through incompetence." The next morning we would awake to learn that Burton's prophecy of a major conflict in North Africa would, sadly, become reality and Ambassador Stevens and three other Americans would be dead. Yesterday I spoke with U.S. Representatives Mike Turner (R-OH) and Ted Poe (R-TX) about the Administration's foreign policy and its subsequent fallout. 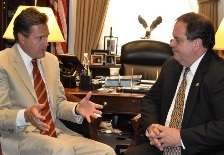 Congressman Turner serves on the House Armed Services Committee and the Oversight Committee. I asked Turner about the events of the day in Libya and Egypt. Turner explained, "I think this calls into question the President's whole strategy on Libya and the Middle East. When the President went in to remove Muammar Gaddafi, he did not have an exit strategy, a transition plan, or even an understanding of who the insurgents were - what government would result from that - the geopolitical view of that government toward its neighbors or specifically even toward us." Turner described Obama's foreign policy as a failure stating, "So now we are in the aftermath of that action where the president is sitting with an ill-defined policy and Americans have been killed and our country is still at risk." Congressman Ted Poe sits on the House Judiciary Committee which held a hearing on "The Abuse of Power by the Obama Administration" yesterday. 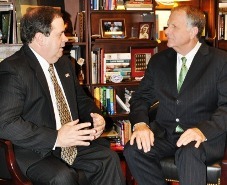 Afterwards, I spoke with Poe about the attacks in Libya and Egypt. Poe said, "This incident was another test of America's will. Over the years, we have had terrorist attacks. Libya in an unstable country - we're not sure who is in charge. The President, in the name of 'humanity' started dropping bombs on Libya." I asked Poe if the President had the legal authority to take this action. Poe explained, "I don't think that he did. The President acted unilaterally without consulting Congress. And the Constitution requires that he consult us. He didn't do that. And so, now there are consequences for what we did." Poe continued,"The real question is, what is our policy? What is our foreign policy in North Africa? What is our foreign policy when you attack a US Embassy? I am not sure we know what it is. It's mixed signals." Clearly, the President's lawless administration has set forth on a dangerous path that has, once again, resulted in the needless loss of American lives. President Obama must not be allowed to continue down this path. He must be removed from office. Our opportunity to do that is coming in less than sixty days at a ballot box near you. If you are still undecided about this president, where he is coming from and what another four years of his lawlessness would bring, I would encourage you to watch the movie "2016: Obama's America". Take a friend with you and then vote in November!